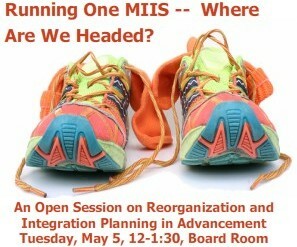 Attend the first of a series of open sessions to imagine the reorganized MIIS and its integration with Middlebury. How will it all work? What will change? How will you be affected? People all over campus are working hard to figure out all the complexities and opportunities inherent in the changes that are underway. We need your perspective and ideas! We lead off with a discussion of Advancement on May 5, at 12 noon in the Board Room. Follow the progress of Runing One MIIS here. If you can’t make a session, give your input online.